Alright, I must confess. I already kind of knew what a Dalek was before I watched this episode. You can’t really be involved in British entertainment culture without hearing mention of them and knowing that they are the greatest enemies of The Doctor. That said I wasn’t quite prepared for the chilling scenes between The Doctor and the Dalek and the emotional punch in the writing and the acting. The TARDIS tracks a distress signal that brings The Doctor and Rose to Utah and deposits them in a museum of alien artifacts placed a half mile below ground. There was a nice moment of continuity with the Slitheen arm on display in one of the cases and The Doctor also notices the head of an enemy on display as well which I’m sure is a nod to the escapades of a previous Doctor. Anyway, soon, Rose and The Doctor are surrounded by security and the episode begins. The viewer is introduced to callous collector and entrepreneur Henry van Statten who supposedly owns the internet. Within the first few seconds of Mr. van Statten being on screen, you know exactly what kind of character he is. He is the archetypal power hungry idiot that you just know is going to screw something up by being greedy before being smart. He is the American accent wielding, testosterone on legs owner of the alien museum and he has a living specimen in the Dalek. The first glimpse of the Dalek, for someone who has not experienced them before, is a little underwhelming. It is a hunk of metal that is broken (due to torture) and unresponsive to the humans. It’s not all that frightening for something that supposedly was a part of the race that destroyed the Time Lords. What gives the Dalek some validity is the reaction The Doctor has upon seeing it for the first time. The absolute terror The Doctor displays when the Dalek is revealed is what gives the viewer a reason for the Dalek to be frightening. This is where Christopher Eccleston gets the credit for the success of this episode. The gamut of emotions The Doctor must portray in his initial scene with the Dalek is wide and daunting but Eccleston pulls it off. He goes from terrified to gleeful in a matter of moments when he realizes the Dalek is broken. The Doctor becomes maniacal, scarily so, when he explains that the Dalek race has been destroyed and then shifts again to a soft sadness when talking about the Time Lords. It almost makes The Doctor feel schizophrenic. Keep in mind, Eccleston manages all this playing against a hunk of metal that is giving him monotone one liners and that is an outstanding achievement. Also, the dialogue in this episode is exquisite, especially for The Doctor and the Dalek. In the initial meeting the Dalek states, “I am alone in the universe.” The Doctor confirms it and the Dalek answers, “So are you. We are the same.” This small interaction sets up the rest of the episode where the lines between hero and nemesis are blurred. 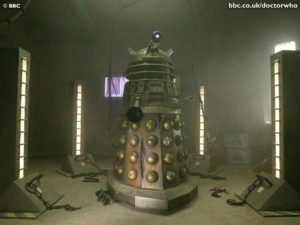 This is a dark connection especially as the Dalek is described as a mutant that has had all emotion erased but hate. 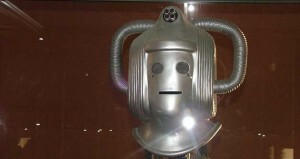 It believes that everything that is different must be exterminated. This is not exactly the parallel that one would want to make with their hero but the writer of this episode, Robert Shearman, is ballsy enough to do it. It pays off.